I tried it......meh....it's nothing special. Back in the 90's, I worked at a pepsi bottling plant, as a vending repairman trainee.It was a pretty cool job, replacing broken vending machines thru out central Cal...needless to say, I got completely hooked on the stuff, to this day. I still think coke is better..but not by much. Cherry coke friggin' ROCKS the house!!! Edited by go2wrk@95974, 26 September 2012 - 01:40 AM. drinking battery acid....oh well, it's Yummy!!!! Has anyone ever drank this soda...? I saw a 12-pack of it on the store shelves the other day and had never seen it before. Wondering what it tastes like and if anyone else likes it. In WI we always called it soda. I liked Sprite, but in WI we would call any lemon-lime soda "white soda". I never ever liked cola of any kind. I learned later "Coke" was their way of saying soda/pop... "you want a Coke?".... "Sure, gimme a Sprite." Crazy, huh? Now I almost never drink soda. Maybe 3 or 4 times a year I will, and it's either Sprecher Root Beer (local) or half Mt Dew/half Sierra Mist at Taco Bell. My uncle used to work for Canada Dry in Kansas City back in the 60's & 70's and we'd always get free soda from him. 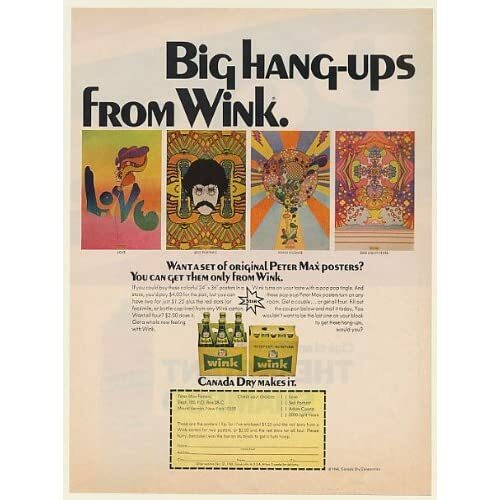 Peter Max did an advertising program with Canada Dry and they had some really cool posters that we got some copies of, but alas they were lost in some move throughout the years. Soda (or pop, as it's called 'round here) has never been my bag. When I was a wee little girl, at friends' birthday parties, I'd be the weird one asking for 'apple juice' while everyone else was downing cans of pop. I don't get it - I don't like the fizziness, and I don't even like the flavours. It's just... sugary, but in a punch-you-in-the-teeth kind of way. And as for plunking down my hard-earned dollars on it? No, thank you. On the other hand, my boyfriend is crazy about pop. He would drink it all the time, install some faucet system, if he could, but he realizes it's not exactly healthy. He once went a month without drinking pop, and ending up losing 10 pounds, just like that! No, give me my favourite: fresh young coconut water, the kind that's straight from a coconut that I've sliced open myself. Nothing in the world is yummier! I have a coke about once a week, with by burger of course! Other than that it is black cherry citrus fresca. Anyone ever heard of the drink called Pomac? A Swedish carbonated soft drink made of fruits and berries and matured in oak barrels for 3 months. It looked like beer. In the 60's my parents drank that. I tasted it once and hated it. It was not sugary, i would probably love it now. Edited by burgeranacoke, 27 September 2012 - 07:19 PM. I saw a 12-pack of it on the store shelves the other day and had never seen it before.� Wondering what it tastes like and if anyone else likes it. Its pretty sweet and is cherry-flavored. I love it but I've only seen it in the south. Its my favorite non-diet soda, so in a way I'm glad that they don't sell it up here. I'd become addicted to it in no time. Anyone ever have this soda? Its one of the most disgusting things I've ever drank. Edited by ColdFireYYZ, 27 September 2012 - 07:22 PM. Moxie, pretty disgusting, people might like it if they love licorice or anise? Thanks. I like cherry but not when it's overpowering. Cherry Coke has just the right amount of cherry. Wild Cherry Pepsi has too much cherry for my taste. I'm going to look for a 2-liter of the Cheerwine so I won't waste much if I don't like it. Wondering if it would make a good mix for a drink? Stephen King's book 11/22/63 devotes several paragraphs to Moxie and makes it pretty clear that he thinks it's foul. Ken (not going to quote the charts) but those are pretty awesome. Accurate for my neck of the woods also, nearly everyone in the Milwaukee area calls it soda. It's true, everyone in New Mexico calls it some thing different. I call it coke, so those demographics do match my area. I'm a Mt. Dew gal - that's my preference. I choose Pepsi over Coke. I like a good cream soda. I would love to find a local place to get sarsaparilla! I usually just mix a bunch of them together. some lotto tickets....tasted AWESOME !!! I am crazy addicted to Paradise Mango.� They better not discontinue this.� It's soooooooooooooooooooooo good. Save Vanilla Coke for special occasions... It tastes better.